Sometimes pictures can speak volumes. Some pictures can open up a whole new world for you. At times, they have the power to penetrate deeply, leaving you speechless. Pictures can leave you in Wonder and depending how extraordinary they are, some of them can at times help restore your faith in the world. Here are some staggering pictures. 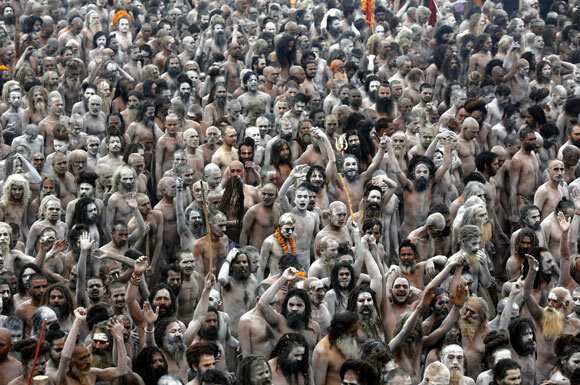 India’s Kumb Mela, coined as “the bigest gathering on Earth.” Where millions of people took a holy dip in the Sangam. It’s quite a spectacle. Ready? I stop by and I see pieces of you. I can’t help to skip a few lines here and there because I find my eyes tear up. And that’s not the feeling I want. The air leaves the room and I try and find it in my lungs. But there’s nothing. I mean there’s nothing here. Am I wasting away here. The void is vast. Why can’t I be as brave? Is that bad? Does it sound like envy? Cause it might be the healthy kind. The kind that catapults me out of this empty sphere. I don’t see walls or corner anymore. There’s a reason people don’t mind taking a walk and turning a corner. Even the same corner on the same street has something unexpected. So should I take that walk? Instead of going around in circles and finding nothing but myself, my preserved hibernated self. Saving away an aging body. Not living with this body. Not absorbing with this mind what I know I can. Leaving it all to what will find me here, in this sphere. A sphere that I alone occupy. I have my thoughts with me and in those thoughts I have you. I guess I can find comfort in that. I smile inside. As I ponder once more, can I be as brave as you? I stop by and I see pieces of you. I can’t help to skip a few lines because I find my eyes tear up. Not sure that’s the feeling I want. The air leaves the room for a while so I try and find it in my lungs. Not sure how or if I am breathing. Is that normal? I mean, I sense a part of me. The me that has occupied this reality. Am I wasting away here? The void is vast. Why can’t I be as brave? Is that bad? Does it sound like envy? Cause it might be the healthy kind. The kind that catapults me out of this empty sphere. I don’t see walls or corner anymore. There’s a reason people don’t mind taking a walk and turning a corner. Even the same corner on the same street has something unexpected. So should I take that walk? Instead of going around in circles and finding nothing but myself, my preserved hibernated self. Saving away an aging body. Not living with this body. Not absorbing with this mind what I know I can. Leaving it all to what will find me here, in this sphere. A sphere that I alone occupy. And no doors that i know of to let anyone in or out. I have my thoughts with me and in those thoughts I have you. I guess I can find comfort in that. I smile inside. As I ponder once more, can I be as brave as you?